Nano Medicine | Genesis Nanotechnology, Inc.
Read Today’s Top Stories in Nanotechnology and the ‘Business’ of Nanotechnology. Stories about the Discoveries and Technologies that will reshape our world and drive New Economic Engines for the Future. A microbial protein fiber discovered by a MSU’s Gemma Reguera transports charges at rates high enough to be applied in manmade nanotechnologies. The discovery, featured in the current issue of Scientific Reports, describes the high-speed protein fiber produced by uranium-reducing Geobacter bacteria. The fibers are hair-like protein filaments called “pili” that have the unique property of transporting charges at speeds of 1 billion electrons per second. Since existing nanotechnologies incorporate exotic metals into their designs, the cost of organic nanowires is much more cost effective as well, she added. How the nanowires function in nature is comparable to breathing. Bacterial cells, like humans, have to breathe. The process of respiration involves moving electrons out of an organism. Geobacter bacteria use the protein nanowires to bind and breathe metal-containing minerals such as iron oxides and soluble toxic metals such as uranium. The toxins are mineralized on the nanowires’ surface, preventing the metals from permeating the cell. Reguera’s team purified their protein fibers, which are about 2 nanometers in diameter. Using the same toolset of nanotechnologists, the scientists were able to measure the high velocities at which the proteins were passing electrons. The researchers also identified metal traps on the surface of the protein nanowires that bind uranium with great affinity and could potentially trap other metals. These findings could provide the basis for systems that integrate protein nanowires to mine gold and other precious metals, scrubbers that can be deployed to immobilize uranium at remediation sites and more. Reguera’s nanowires also can be modified to seek out other materials in which to help them breathe. This discovery came from truly listening to bacteria, Reguera said. The above post is reprinted from materials provided by Michigan State University. Note: Materials may be edited for content and length. Researchers involved in a national effort to develop cancer treatments that harness nanotechnology are recommending pivotal changes in the field because experiments with laboratory animals and efforts based on current assumptions about drug delivery have largely failed to translate into successful clinical results. 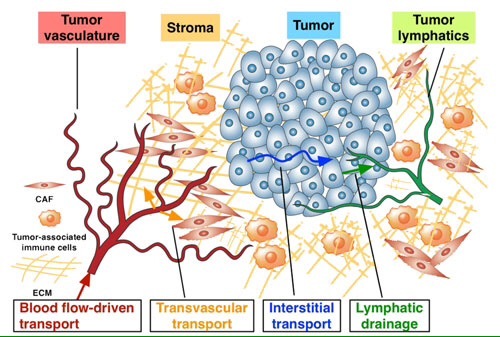 The assessment was advanced in a perspective piece that (“Targeting the Tumor Microenvironment”; pdf) appeared in the National Cancer Institute’s Cancer Nanotechnology Plan 2015, a 10-year roadmap concerning the use of nanotechnology to attack cancer. Researchers are trying to perfect “targeted delivery” methods using various agents, including an assortment of tiny nanometer-size structures, to selectively attack tumor tissue. However, the current direction of research has brought only limited progress, according to the authors of the article. “The bottom line is that so far there are only a few successful nanoparticle formulations approved and clinically used, so we need to start thinking out of the box,” said Bumsoo Han, a Purdue University associate professor of mechanical and biomedical engineering. One approach pursued by researchers has been to design nanoparticles small enough to pass through pores in blood vessels surrounding tumors but too large to pass though the pores of vessels in healthy tissue. The endothelial cells that make up healthy blood vessels are well organized with tight junctions between them. However, the endothelial cells in blood vessels around tumors are irregular and misshapen, with loose gaps between the cells. The two authored the article with Murray Korc, the Myles Brand Professor of Cancer Research at the Indiana University School of Medicine. The authors pointed out that research with laboratory mice has rarely translated into successful clinical results in humans, suggesting that a more effective approach might be to concentrate on research using in-vitro experiments that mimic human physiology. For example, one new system under development, called a tumor-microenvironment-on-chip (T-MOC) device, could allow researchers to study the complex environment surrounding tumors and the barriers that prevent the targeted delivery of therapeutic agents. The approach could help drug makers solve a daunting obstacle: even if drugs are delivered to areas near the target tumor cells, the treatment still is hindered by the complex microenvironment of tumors. An “extracellular matrix” near tumors includes dense collagen bundles and a variety of enzymes, growth factors and cells. For example, surrounding pancreatic tumors is a “stromal compartment” containing a mixture of cells called stromal cells, activated cancer-associated fibroblasts and inflammatory immune cells. “Particularly for pancreatic cancer, the stromal tissue is much bigger than the tumor itself,” Korc said. In addition, a compound called hyaluronic acid in this stromal layer increases the toughness of tumor microenvironment tissue, making it difficult for nanoparticles and drugs to penetrate. “It’s dense, like scar tissue, so it’s more difficult for drugs coming out of the blood vessel to diffuse through this tissue,” Han said. Another challenge is to develop water-soluble drugs to effectively deliver medicines. “The cancer drugs need to be aqueous because the body resorbs them better, but a lot of the current chemotherapy drugs have low solubility and usually need different types of solvents to increase their solubility,” Park said. The T-MOC approach offers some hope of learning how to design more effective cancer treatments. Such a major shift in research focus could play a role in developing personalized medicine, or precision medicine, tailored to a particular type of cancer and specific patients. More effective treatment might require various “priming agents” in combination with several drugs to be administered simultaneously or sequentially. Chemotherapy isn’t supposed to make your hair fall out—it’s supposed to kill cancer cells. A new molecular delivery system created at U of T could help ensure that chemotherapy drugs get to their target while minimizing collateral damage. Many cancer drugs target fast-growing cells. Injected into a patient, they swirl around in the bloodstream acting on fast-growing cells wherever they find them. That includes tumours, but unfortunately also hair follicles, the lining of your digestive system, and your skin. Professor Warren Chan (IBBME, ChemE, MSE) has spent the last decade figuring out how to deliver chemotherapy drugs into tumours—and nowhere else. Now his lab has designed a set of nanoparticles attached to strands of DNA that can change shape to gain access to diseased tissue. One thing we know about cancer: no two tumours are identical. Early-stage breast cancer, for example, may react differently to a given treatment than pancreatic cancer, or even breast cancer at a more advanced stage. Which particles can get inside which tumours depends on multiple factors such as the particle’s size, shape and surface chemistry. Chan and his research group have studied how these factors dictate the delivery of small molecules and nanotechnologies to tumours, and have now designed a targeted molecular delivery system that uses modular nanoparticles whose shape, size and chemistry can be altered by the presence of specific DNA sequences. “We’re making shape-changing nanoparticles,” says Chan. “They’re a series of building blocks, kind of like a LEGO set.” The component pieces can be built into many shapes, with binding sites exposed or hidden. They are designed to respond to biological molecules by changing shape, like a key fitting into a lock. These shape-shifters are made of minuscule chunks of metal with strands of DNA attached to them. 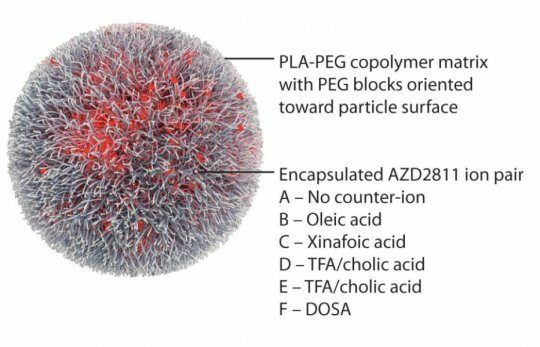 Chan envisions that the nanoparticles will float around harmlessly in the blood stream, until a DNA strand binds to a sequence of DNA known to be a marker for cancer. When this happens, the particle changes shape, then carries out its function: it can target the cancer cells, expose a drug molecule to the cancerous cell, tag the cancerous cells with a signal molecule, or whatever task Chan’s team has designed the nanoparticle to carry out. Their work was published this week in two key studies in the Proceedings of the National Academy of Sciences and the leading journal Science. Applying nanotechnology and materials science to medicine, and particularly to targeted drug delivery, is still a relatively new concept, but one Chan sees as full of promise. The real problem is how to deliver enough of the nanoparticles directly to the cancer to produce an effective treatment. “We’ve only scratched the surface of how nanotechnology ‘delivery’ works in the body, so now we’re continuing to explore different details of why and how tumours and other organs allow or block certain things from getting in,” adds Chan. He and his group plan to apply the delivery system they’ve designed toward personalized nanomedicine—further tailoring their particles to deliver drugs to your precise type oftumour, and nowhere else. Imagine a hand-held environmental sensor that can instantly test water for lead, E. coli, and pesticides all at the same time, or a biosensor that can perform a complete blood workup from just a single drop. That’s the promise of nanoscale plasmonic interferometry, a technique that combines nanotechnology with plasmonics—the interaction between electrons in a metal and light. Now researchers from Brown University’s School of Engineering have made an important fundamental advance that could make such devices more practical. The research team has developed a technique that eliminates the need for highly specialized external light sources that deliver coherent light, which the technique normally requires. The advance could enable more versatile and more compact devices. The research is described in Nature Scientific Reports. Plasmonic interferometers make use of the interaction between light and surface plasmon polaritons, density waves created when light energy rattles free electrons in a metal. One type of interferometer looks like a bull’s-eye structure etched into a thin layer of metal. In the center is a hole poked through the metal layer with a diameter of about 300 nanometers—about 1,000 times smaller than the diameter of a human hair. The hole is encircled by a series of etched grooves, with diameters of a few micrometers. Thousands of these bulls-eyes can be placed on a chip the size of a fingernail. When light from an external source is shown onto the surface of an interferometer, some of the photons go through the central hole, while others are scattered by the grooves. Those scattered photons generate surface plasmons that propagate through the metal inward toward the hole, where they interact with photons passing through the hole. That creates an interference pattern in the light emitted from the hole, which can be recorded by a detector beneath the metal surface. When a liquid is deposited on top of an interferometer, the light and the surface plasmons propagate through that liquid before they interfere with each other. That alters the interference patterns picked up by the detector depending on the chemical makeup of the liquid or compounds present in it. By using different sizes of groove rings around the hole, the interferometers can be tuned to detect the signature of specific compounds or molecules. With the ability to put many differently tuned interferometers on one chip, engineers can hypothetically make a versatile detector. Up to now, all plasmonic interferometers have required the use of highly specialized external light sources that can deliver coherent light—beams in which light waves are parallel, have the same wavelength, and travel in-phase (meaning the peaks and valleys of the waves are aligned). Without coherent light sources, the interferometers cannot produce usable interference patterns. Those kinds of light sources, however, tend to be bulky, expensive, and require careful alignment and periodic recalibration to obtain a reliable optical response. But Pacifici and his group have come up with a way to eliminate the need for external coherent light. In the new method, fluorescent light-emitting atoms are integrated directly within the tiny hole in the center of the interferometer. An external light source is still necessary to excite the internal emitters, but it need not be a specialized coherent source. In this new device, incoherent light shown on the interferometer causes the fluorescent atoms inside the center hole to generate surface plasmons. Those plasmons propagate outward from the hole, bounce off the groove rings, and propagate back toward the hole after. Once a plasmon propagates back, it interacts with the atom that released it, causing an interference with the directly transmitted photon. Because the emission of a photon and the generation of a plasmon are indistinguishable, alternative paths originating from the same emitter, the process is naturally coherent and interference can therefore occur even though the emitters are excited incoherently. In addition to eliminating the need for specialized external light sources, the approach has several advantages, Pacifici said. Because the surface plasmons travel out from the hole and back again, they probe the sample on top of the interferometer surface twice. That makes the device more sensitive. But that’s not the only advantage. In the new device, external light can be projected from underneath the metal surface containing the interferometers instead of from above. That eliminates the need for complex illumination architectures on top of the sensing surface, which could make for easier integration into compact devices. The embedded light emitters also eliminate the need to control the amount of sample liquid deposited on the interferometer’s surface. Large droplets of liquid can cause lensing effects, a bending of light that can scramble the results from the interferometer. Most plasmonic sensors make use of tiny microfluidic channels to deliver a thin film of liquid to avoid lensing problems. But with internal light emitters excited from the bottom surface, the external light never comes in contact with the sample, so lensing effects are negated, as is the need for microfluidics. Finally, the internal emitters produce a low intensity light. That’s good for probing delicate samples, such as proteins, than can be damaged by high-intensity light. More work is required to get the system out of the lab and into devices, and Pacifici and his team plan to continue to refine the idea. The next step will be to try eliminating the external light source altogether. It might be possible, the researchers say, to eventually excite the internal emitters using tiny fiber optic lines, or perhaps electric current. Still, this initial proof-of-concept is promising, Pacifici said. “From a fundamental standpoint, we think this new device represents a significant step forward,” he said, “a first demonstration of plasmonic interferometry with incoherent light”. Some drug regimens, such as those designed to eliminate tumors, are notorious for nasty side effects. Unwanted symptoms are often the result of medicine going where it’s not needed and harming healthy cells. To minimize this risk, researchers in Quebec have developed nanoparticles that only release a drug when exposed to near-infrared light, which doctors could beam onto a specific site. Their report appears in the Journal of the American Chemical Society. For years, scientists have been striving to develop localized treatments to reduce side effects of therapeutic drugs. They have designed drug-delivery systems that respond to light, temperature, ultrasound and pH changes. One promising approach involved drug-carrying materials that are sensitive to ultraviolet (UV) light. Shining a beam in this part of the light spectrum causes the materials to release their therapeutic cargo at a designated location. But UV light has major limitations. It can’t penetrate body tissues, and it is carcinogenic. Near-infrared (NIR) light can go through 1 to 2 centimeters of tissue and would be a safer alternative, but photosensitive drug-carriers don’t react to it. McGill University engineering professor Marta Cerruti and colleagues sought a way to bring the two kinds of light together in one possible solution. The researchers started with nanoparticles that convert NIR light into UV light and coated them in a UV-sensitive hydrogel shell infused with a fluorescent protein, a stand-in for drug molecules. When exposed to NIR light, the nanoparticles instantaneously converted it to UV, which induced the shell to release the protein payload. The researchers note that their on-demand delivery system could not only supply drug molecules but also agents for imaging and diagnostics. Bryan Berger, Himanshu Jain, Chao Zhou and a half dozen other faculty members were invited to give presentations last month at the TechConnect 2015 World Innovation Conference. Lehigh’s participation was organized by the Office of Technology Transfer. Lehigh scientists and engineers won three National Innovation Awards recently at the TechConnect 2015 World Innovation Conference and National Innovation Showcase held in Washington, D.C. The awards were for a nanoscale device that captures tumor cells in the blood, a bioengineered enzyme that scrubs microbial biofilms, and a safe, efficient chemical reagent that is stable at room temperature. Lehigh’s TechConnect initiative was led by the Office of Technology Transfer (OTT) which manages, protects and licenses intellectual property (IP) developed at Lehigh. Yatin Karpe, associate director of the OTT, spearheaded the Lehigh effort and is pursuing IP protection and commercialization for the innovations. The P.C. Rossin College of Engineering and Applied Science, led by former interim Dean Daniel Lopresti, and the Office of Economic Engagement, led by assistant vice president Cameron McCoy, supported Lehigh’s third-straight appearance at the annual conference. The three National Innovation Awards were chosen through an industry review of the top 20 percent of annually submitted technologies and based on the potential positive impact the technology would have on industry. This is the third year in a row that Lehigh has won Innovation Awards. No institution received more than three in 2015. • Yaling Liu, assistant professor of mechanical engineering and mechanics and a member of the bioengineering program, has developed a tiny device that can capture tumor cells circulating in the blood and can potentially indicate disease type, as well as genetic and protein markers that may provide potential treatment options. • Bryan Berger, assistant professor of chemical and biomolecular engineering, hopes to improve food safety and keep medical devices clean with an enzyme he’s developed that attacks biofilms. • David Vicic, professor and department chair of chemistry, has created a new chemical reagent that is stable at room temperature, potentially eliminating the use of traditional hazardous regents. TechConnect is one of the largest multi-sector gatherings in the world of technology intellectual property, technology ventures, industrial partners and investors. The event brings together the world’s top technology transfer offices, companies and investment firms to identify the most promising technologies and early stage companies from across the globe. “This event is a productive opportunity to establish new connections with industry and government partners, many within easy reach of Lehigh,” said Gene Lucadamo, the industry liaison for Lehigh’s Center for Advanced Materials and Nanotechnology and the Lehigh Nanotech Network. In addition to the three National Innovator Awards, Lehigh researchers won seven National Innovation Showcase awards and presented five conference papers in areas as diverse as the biomanufacturing of quantum dots, a 3-D imaging technique 20 times faster than current systems, the creation of a miniature medical oxygen concentrator for patients with Chronic Obstructive Pulmonary Disease (COPD), and a biomedically superior bioactive glass that mimics bone. Attendees include innovators, funding agencies, national and federal labs, international research organizations, universities, tech transfer offices and investment and corporate partners. The 2015 TechConnect World Innovation event encompasses the 2015 SBIR/STTR National Conference, the 2015 National Innovation Summit and Showcase, and Nanotech2015—the world’s largest nanotechnology event.